An unorthodox historian known and respected for his work on the grand conflicts of nations and civilizations, John Lukacs has peopled a smaller canvas in this volume, with seven colourful figures who flourished in Philadelphia before 1950. 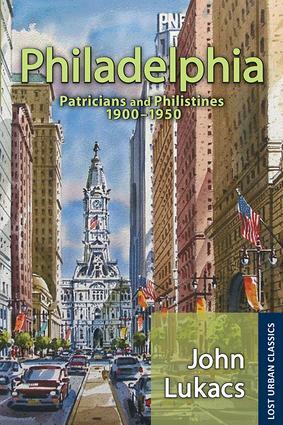 Their stories are framed by chapters that describe the city in 1900 and in 1950.The Philadelphians selected are a political boss, Boies Penrose; a magazine mogul, Edward Bok; an elegant writer, Agnes Repplier; an impetuous diplomat, William C. Bullitt; a lawyer, George Wharton Pepper; a prophet of decline, Owen Wister; and a great art collector, Albert C. Barnes. The political boss was perhaps the most monumental political figure of his age. The magazine mogul was the most famous embodiment of the American success story during his lifetime. The now almost forgotten writer was the Jane Austen of the essay. The diplomat was the most brilliant of ambassadors. The terrible-tempered collector was a radical proponent of his unusual theory of art.Through these seven portraits, Lukacs paints a picture of Philadelphia that is "like all living things, having the power to change out of recognition and yet remain the same." This work is a must read for all historians�and Philadelphians.